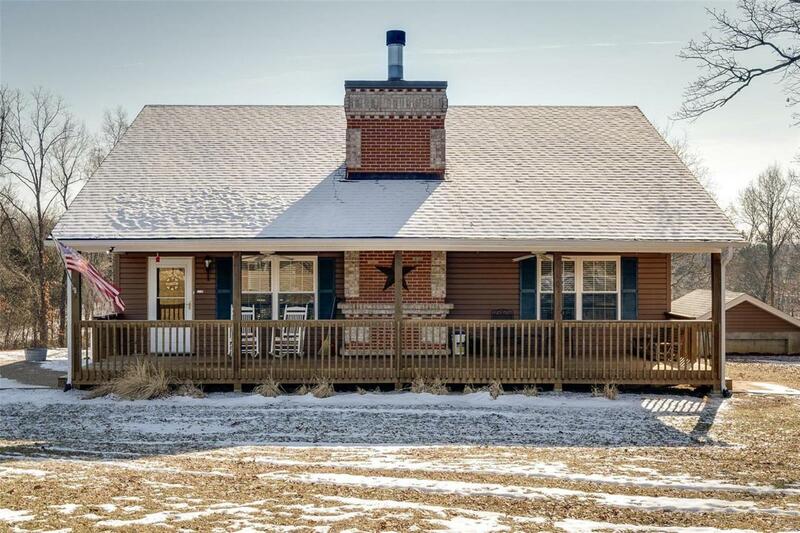 Country living at its best - Enjoy the full covered front porch as you enter the new front door of this home, approx 2300 total sq foot of living. 2 lakes, wooded acreage all with Blacktop frontage.Home offers open vaulted living area, 2 decks that overlook in ground pool and back lake. Custom kitchen with Stainless steel counter tops, pantry and breakfast bar. Beautiful floor to ceiling, stone wood burning fireplace in living room. Sliding Barn door leads you into the main floor bedroom. Two additional bedrooms in walk out lower level and full spacious bath. Property offers utility shed, 4 different fruit trees, peach, pear, apple and plum, blackberries and blueberry bushes plus garden area. Beautiful setting as you pull in the driveway with brick pillars and rose bushes.Updates include New roofs and gutters (2015) Deep well motor and pump (2016) New hot water heater. New front door and screen door.